There's no doubt about it — dentures have changed your life. Now you can eat and speak normally, and smile again with confidence. But if you're going to continue to benefit from your dentures, you'll need to take care of them. One of the best things you can do is not sleep with them in. 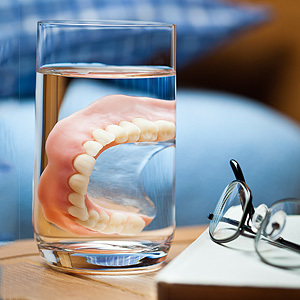 There are a couple of important reasons why you should take your dentures out when you go to bed. First, dentures tend to compress the bony ridges of the gums that support them. This contributes to the loss of the underlying bone, an occurrence common with missing teeth. Wearing dentures around the clock can accelerate this bone loss, which eventually loosens your denture fit. Constant denture wearing also contributes to mouth conditions conducive to dental disease. You're more likely to develop tongue and denture plaque (a thin film of bacteria and food particles) that can cause gum inflammation or yeast development. The presence of the latter could also trigger a chronic response from your immune system that might make you more susceptible to other diseases. Good oral hygiene is just as important with dentures as with natural teeth. Besides removing them at night, you should also take them out and rinse them after eating and brush them at least once a day with a soft tooth brush. And be sure to use regular dish or hand soap (especially antibacterial) or denture cleanser — toothpaste is too abrasive for denture surfaces. It's also a good habit to store your dentures in water or, better, an alkaline peroxide solution. This will help deter plaque and yeast development. And don't forget the rest of your mouth: brush your tongue and gums with a very soft toothbrush (different from your denture brush) or clean them off with a damp cloth. Taking care of your dentures will ensure two things. You'll lower your risk for disease — and you'll also help extend your dentures' life and fit. If you would like more information on caring for your dentures, please contact us or schedule an appointment for a consultation.